I was on a crowded Metro North train during rush hour. Commuters were making their way back to their suburban Westchester homes. It was standing room only—and I was standing. I wasn’t happy about that. I wasn’t happy that Gerry summoned our group out of the city and to the sleepy hamlet of Valhalla to a place called Kensico Kitchen. The train finally pulled in and I joined the throngs exiting and heading to their cars in the parking lot. Just across the street from the train station and the Taconic parkway, I could see our group sitting on makeshift picnic tables on the sidewalk in front of Kensico Kitchen on Valhalla’s tiny main strip. 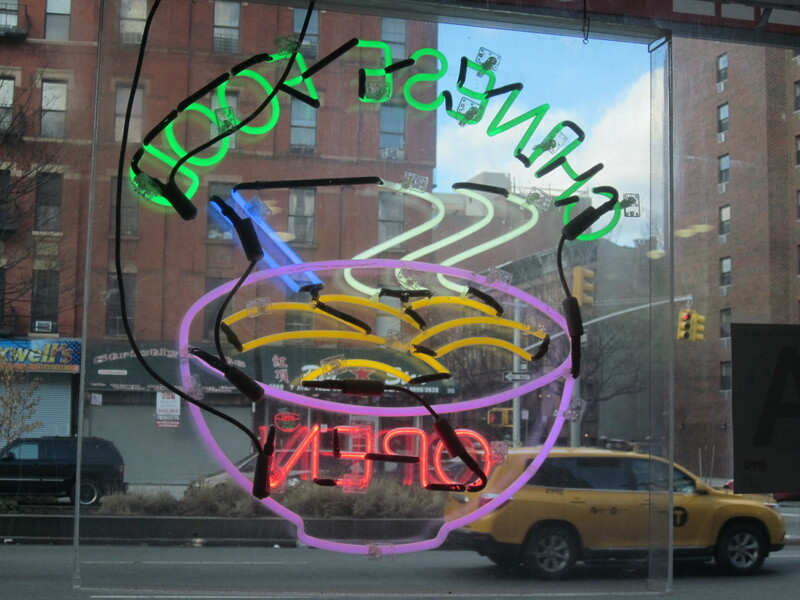 The “Kitchen” was really a deli; New York lottery signs and tickets were plastered to the window along with stock photos of deli sandwiches, bagels, wraps and other traditional bodega/deli items. What had Gerry lured us into? Though no menus were in front of us, Mike from Yonkers proclaimed that he was up for a ham and cheese sandwich. A ham and cheese sandwich? Was that why I rode the commuter special to this godforsaken sleepy hamlet? “Are there menus?” I asked Gerry. He shook his head. “The food will be coming,” he said and pulled a cold Corona out from a six pack at his feet and handed it to me. That was a good start. When one of the owners of the Kensico Kitchen, apparently a Mexican family Gerry was familiar with, came to our table with a molcajete overflowing with green salsa and cilantro, things were beginning to get even better. “Guacamole coming,” the man said and soon it did come along with a massive platter of chips covered with an assortment of empanadas, beef, chicken and vegetable. The platter had Mike from Yonkers rise in excitement and move around from his seat to eagerly shovel chips, salsa, guacamole and empanadas on his plate. Eugene, fresh off his whirlwind, Southern Italy and Sicily tour where he proudly proclaimed: “We had pizza everyday…sometimes twice,” had no trouble veering to equally carb heavy cuisine of Mexico, devouring a plate of chips, guacamole and empanadas. One of the women in the family came to our table to tell us she would be bring us either chicken mole or pernil with chili rellenos poblano. “What about the adobo?” Gerry inquired. “You want adobo too?” She checked with him. Gerry nodded. For him more was almost always merrier. We were scraping up the remains of the guacamole and chips when plates began arriving; a quarter of a chicken in a red adobo sauce, some shredded pernil (pork) and a mound of yellow Mexican rice and refried black beans. As an accompaniment to our gargantuan plates, we were also served a platter of fried poblano chilies stuffed with queso. As if we didn’t have enough; two plates of half chickens in a rich dark mole sauce were also presented, “so you can try the mole too,” our waitress cheerily said. Despite his strong start, Mike from Yonkers fizzled early leaving enough food on his plate to take home to his hungry wife. But he was the exception. Already weighted down by the empanadas and guacamole, I did admirable work clearing my plate, but all I could attempt of the chicken mole was a small forkful while the others showed what made them the gluttons they were devouring all that was placed in front of them. But my proclamation fell on deaf ears, drowned out by the blasting horn of a Metro North train as it rushed its commuters to Brewster…or Pawling…or some other suburban hamlet where, if they are lucky, there will also be a deli serving bagels, wraps, ham and cheese sandwiches, and mole and adobo. The growing season on our terrace was an uneven one. Most of the spring was very cool and wet. By the end of June and early July we entered a brief period of extreme heat followed by an abnormally cool late summer concluding with a warm, dry early fall. The tomatoes didn’t fare so well, but the chili peppers were abundant and as of this writing continue to thrive. Last year I grew “Portugal Hots,” and “Fresno,” peppers. They too were prolific and, as chronicled in these pages, I used the excess to make pepper sauces. See A Pair of Pepper Sauces. 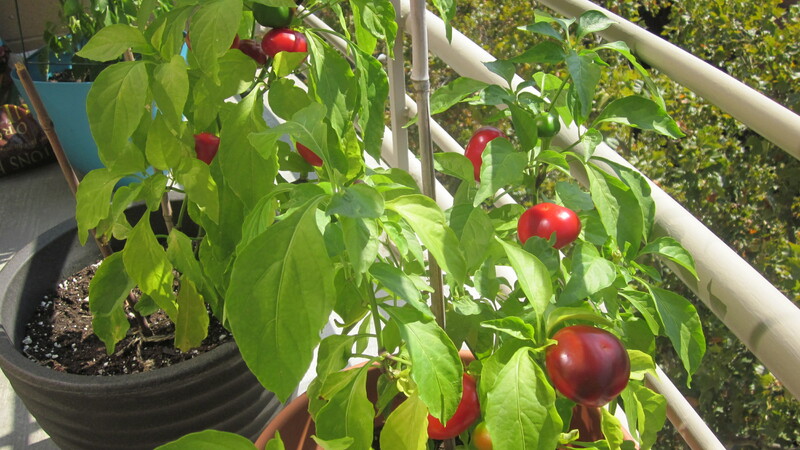 This year I mixed it up a little planting hot cherry peppers and cayenne’s. As always, I freeze most of the crop and use them when needed; adding the peppers to soups, sauces, Asian or Indian stir fried dishes or anything else I’m cooking that could use a spice kick. But there is always much more than I will need to last a year. So what to do with the excess? 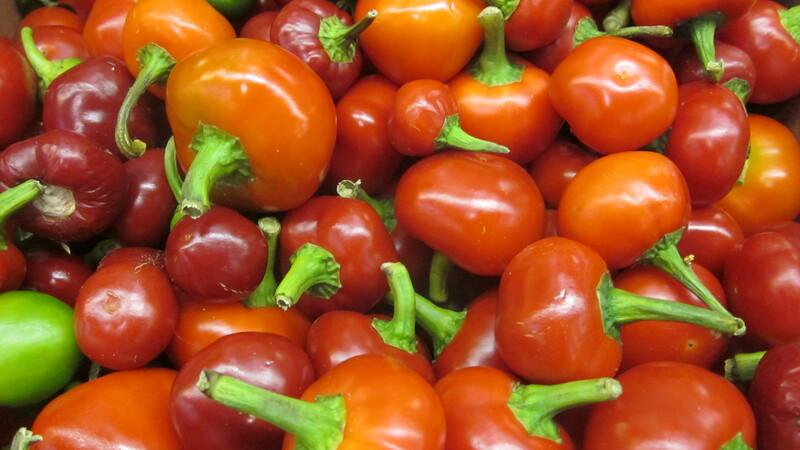 Some of the cherry pepper crop. This year I decided to pickle the peppers. There is nothing like a few slices of hot vinegar cherry peppers on an Italian hero or chopped into an antipasto or baccala salad, so instead of buying a store brand, I figured with all I had, I could make my own. 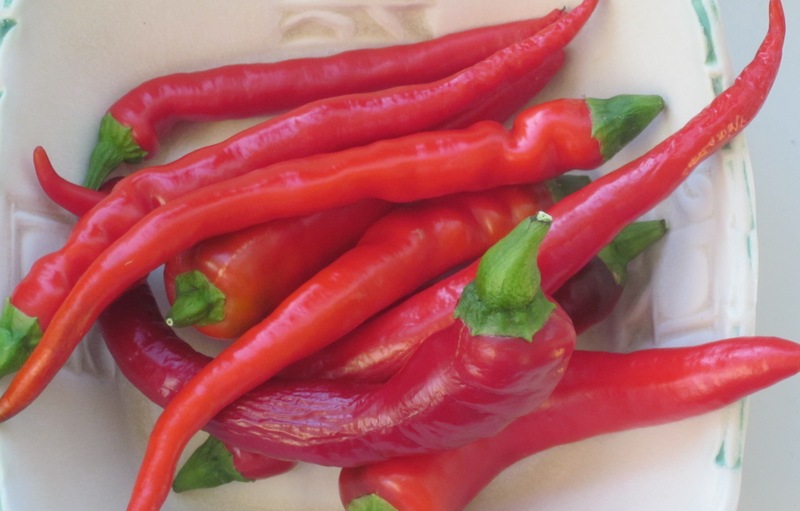 I deliberated over what then to do with the cayenne peppers. I was very tempted just to make another pepper sauce, maybe something very much like Tabasco, which uses cayenne peppers. Instead I took a much easier path deciding to chop up the fiery red peppers, squeeze them into decorative jars, add hot white vinegar and let the vinegar infuse in the spice of the chilies. My estimation is that after two weeks, I’ll be able to sprinkle the vinegar on collard greens, Swiss chard, rice and beans or anything else that might welcome the combination flavors of hot and sour. Check back with me later on that prognosis. Here are the very simple recipes for both. 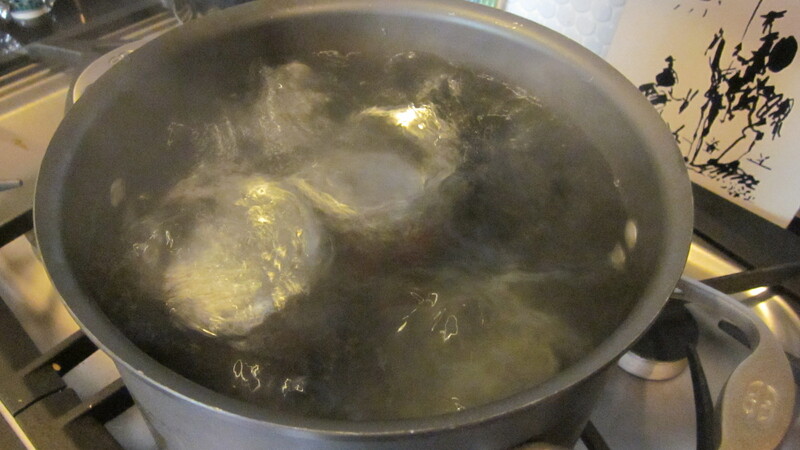 Add the vinegar, water, sugar and salt to a saucepan and bring to a boil. In the meantime, make a few incisions near the stem of the cherry peppers. Make sure the jars and tops are sterilized by boiling them or putting them in the dishwasher. In each jar (how many you use depends on the size of your jars) add one whole peeled clove of garlic, a bay leaf and a bunch of the peppercorns. Stuff in the cherry peppers tightly. 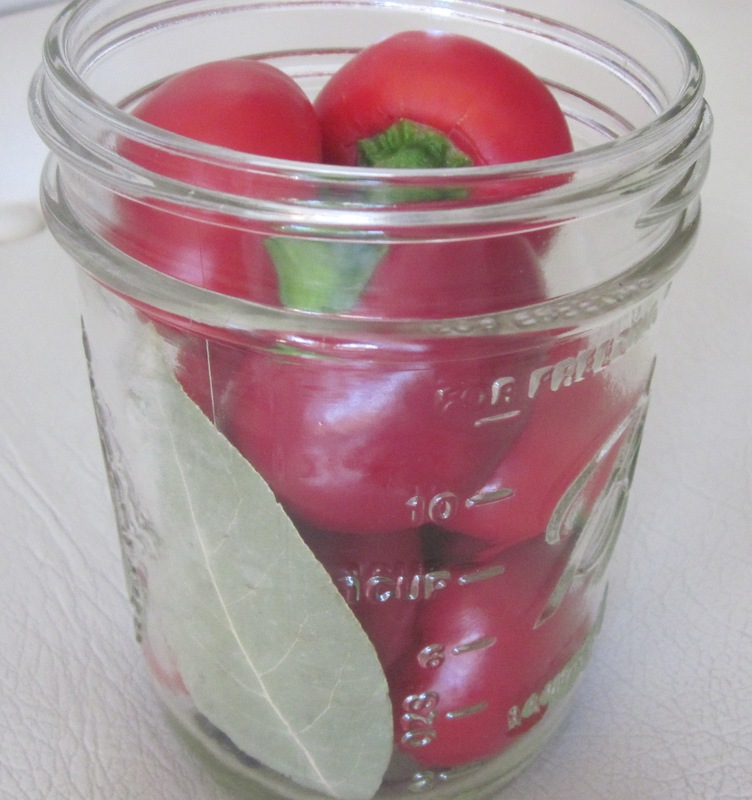 When the brine has boiled and the sugar and salt has dissolved, pour the liquid into the jars covering the cherry peppers leaving about ¼ inch of the jar empty. A cherry pepper water bath. 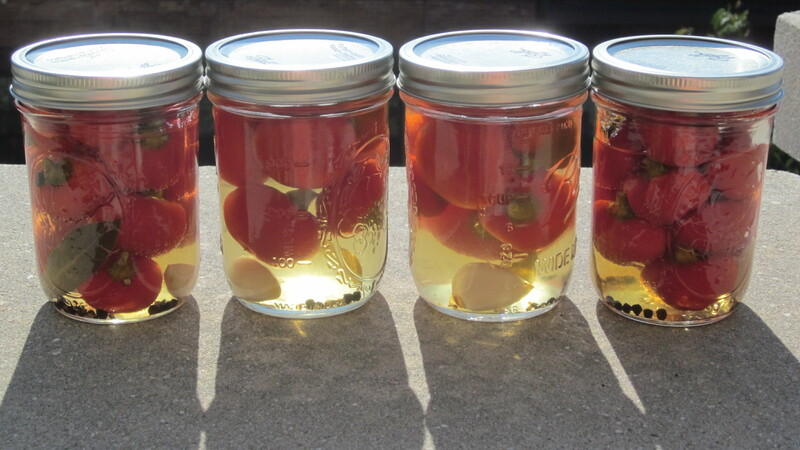 Remove the jars and if you hear that pop signifying that the jar has been vacuumed-sealed or you see that the lid is slightly indented, chances are very good that your pickled cherry tomatoes are properly sealed. *I had never done the water bath thing before. I have always been wary of improperly sealing the jars thus imperiling my loved ones with contaminated food. This time I took a chance and all the signs seem to indicate that the canning was successful. Again, check back with me later on that. Chop up the peppers, making sure to use gloves before handling them. Bring the vinegar to a boil. How much you use depends on how many peppers you have, and how big or also how many jars you intend to make. Stuff the chopped peppers into your jars. I used a decorative salad oil/vinegar receptacle. 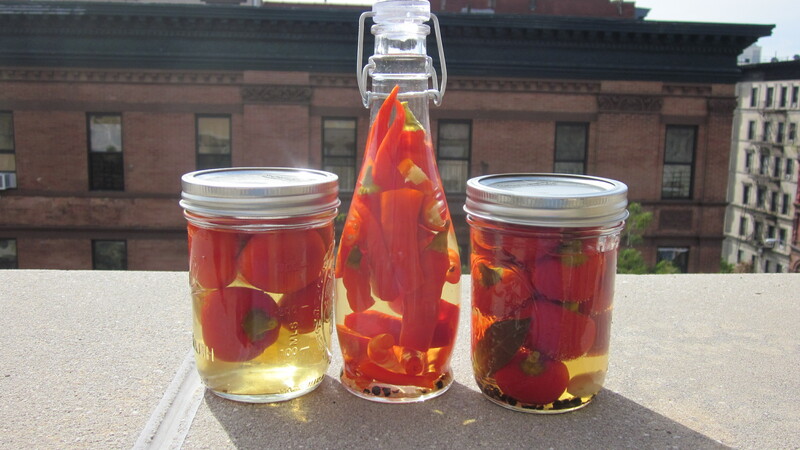 Using a funnel, unless the top of your jar is wide enough, pour the hot vinegar over the peppers leaving ¼ inch of space from the top. Put the top on and store in a cool dry place for at least two weeks before using. Because you’ve made vinegar, a natural preservative, there is no need to seal these jars. The vinegar should last months, if not years, but you will probably finish it before you’ll have to worry about such things. 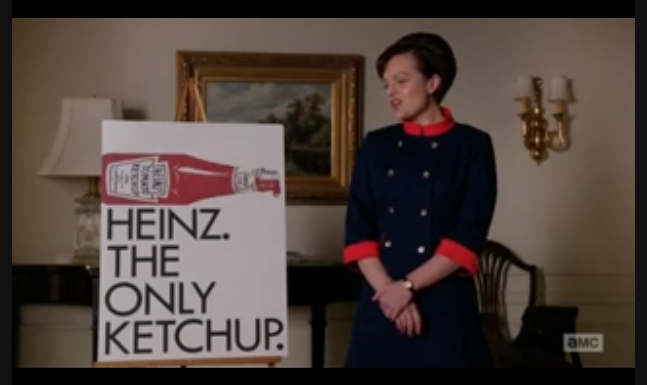 Back in 1968, when, according to the imagination of television’s Mad Men creator, Matthew Weiner, groups of Mad men were competing for the Heinz ketchup advertising account, the Sloppy Joe was a staple of my suburban diet. Usually it was made from a wet mix in a can or dehydrated in a little packet. All you had to do was add the can of wet to the ground beef and cook it up. With the dry, you added water and tomato paste. The mess was always served on a hamburger roll. 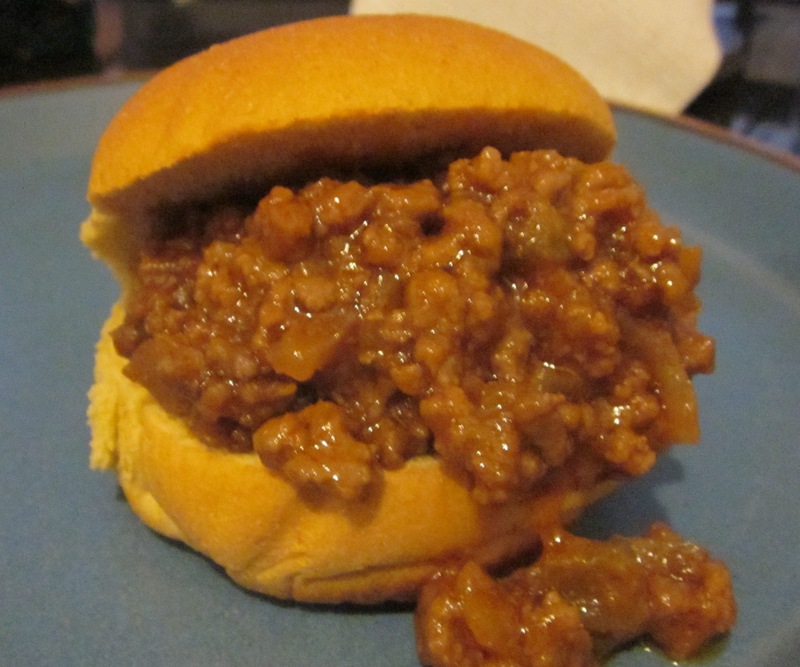 Though pretty much long gone from my menu, the Sloppy Joe taste, slightly sweet, along with the salty ground beef, a touch of acid from the tomatoes, the crunch of onion, the sauce drenching the roll was unique and one I still vividly recall. 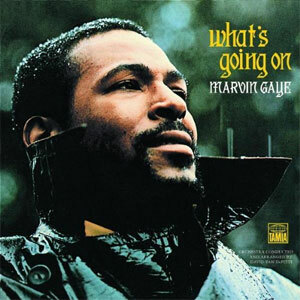 As it was in 1968, it is today. 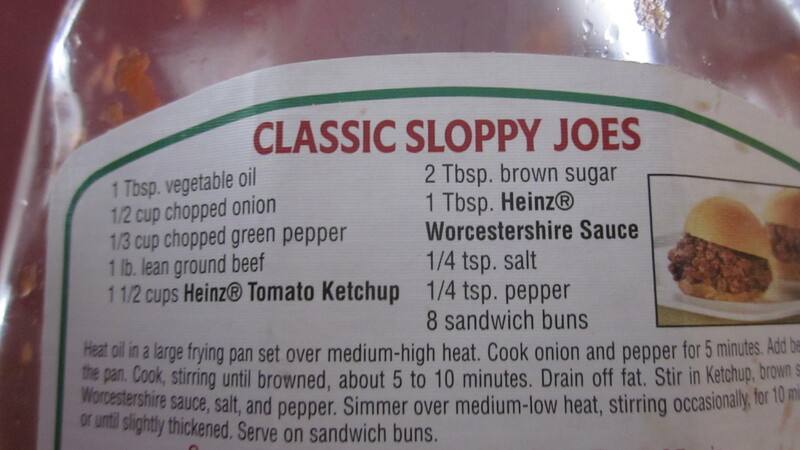 I hadn’t thought of the Sloppy Joe until I noticed a recipe for it on the back of a plastic Heinz ketchup bottle. That recipe and the iconic condiment: Heinz ketchup, the account of which was bitterly fought over by the fictional Mad men of Mad Men inspired me to revive that childhood classic knowing very well that childhood taste recall doesn’t always live up to the memory hype. My kids now are about the same age I was when my mother made it a monthly regular in our family’s menu. Would they feel the same way about the Sloppy Joe I did? I couldn’t imagine they wouldn’t, but who knew? 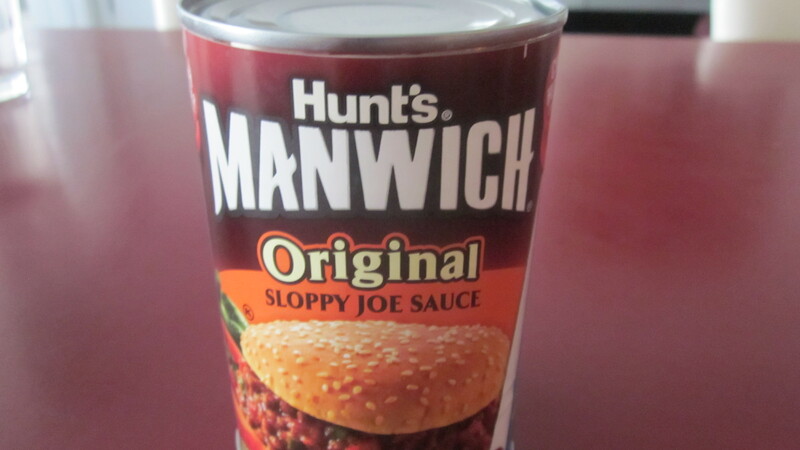 Even without the using dry seasonings or the “Manwich” version, the recipe looked simple, as it should be. But once I began preparations, I noticed a potential problem: the recipe called for one and half cups of ketchup plus two tablespoons of brown sugar. The brown sugar combined with the “high fructose corn syrup” already in the ketchup was going to make this a sweet Sloppy Joe. Maybe it was always too sweet and, as a kid with a serious sweet tooth, I just didn’t realize it. Now as an adult with a somewhat mellower sweet tooth, would the Sloppy Joe be too saccharin for my taste? Should I go with my instincts and alter the recipe eliminating either half or all of the brown sugar. I decided not to do anything and if needed, I would do damage control after the fact. Recipe courtesy of the H.J Heinz Company. 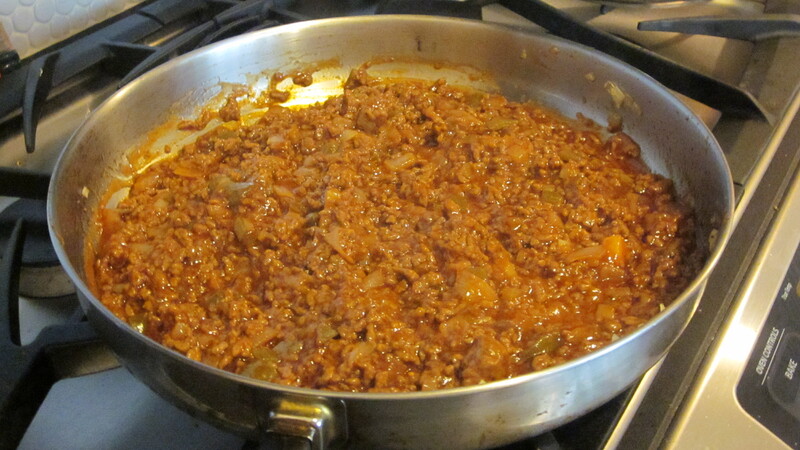 Making the Sloppy Joe really was about as easy as it gets. I followed the directions, cooking the peppers and onions, adding the beef, skimming off the fat, and then pouring in the ketchup, the brown sugar, Worcestershire sauce, salt and pepper and then cooking it on medium heat for about ten minutes until it thickened. Just ten minutes and it’s done. Finally I tasted it. This was most definitely the Sloppy Joe of my memory, yet a very sweet one. I sprinkled in chili powder and added a few drops of hot sauce. That took the sweetness down a few notches, but not enough. The damage could not be undone. It was just too sweet for my tastes. Next time—and there would be a next time—I planned on either eliminating the ketchup altogether and substituting tomato paste with a teaspoon of brown sugar or maybe combining ketchup and tomato paste but nixing the sugar. But after witnessing both of my boys licking from their fingers what had spilled from their buns, I realized that maybe I was thinking too much of myself. Why should I impose my so-called adult taste on them? Maybe, I thought, I should just leave well enough alone and let them have their own sweet Sloppy Joe memories. In the latter quarter of the previous century when I was in college, my dorm buddies and I had many bong and beer fueled discussions. Subjects ranged from who was the better detective, Kojak or Baretta, what was the best bathroom reading—and why, Penthouse or Hustler, or which album, Marvin Gaye’s “What’s Going On,” Steely Dan’s “Aja,” or Earth Wind and Fire’s “That’s the Way of the World,” would make it into the top five of best albums of all time list (see the photo below for my pick). Most of the time, the discussions remained semi-civil. 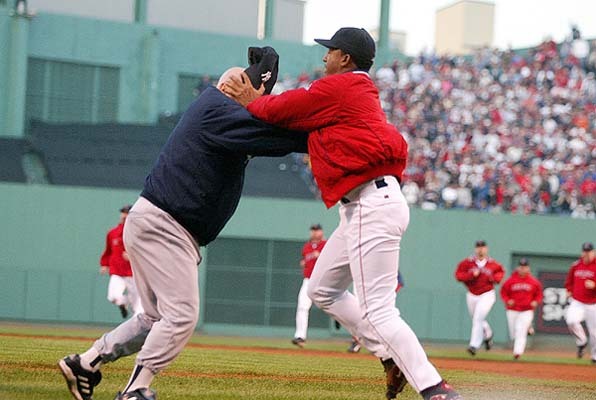 When the subject was the Yankee-Red Sox rivalry, it could get very heated. In the hot category, though not as hot as the Yankees-Red Sox discussions, was the debate over sauce or gravy. For some reason, for the Italian-Americans I roomed with, myself included, calling tomato sauce gravy, or vice versa ignited personal passions that boarded on the irrational. In the gravy corner were my friends from Massachusetts and New Jersey. The sauce contingent seemed to be from Connecticut and New York, where I was from. How, I asked when I heard it for the first time, can you put gravy on pasta? Gravy, I always knew as something brownish in color and layered on turkey, roast beef, or meat loaf. This was an affront to my Italian-American sensibilities. The corruption of a basic known culinary term. A gross misuse of nomenclature. “If you’re really Italian, you call it gravy,” was the insult that was thrown back at me when I confessed my disgust at the vulgarity. 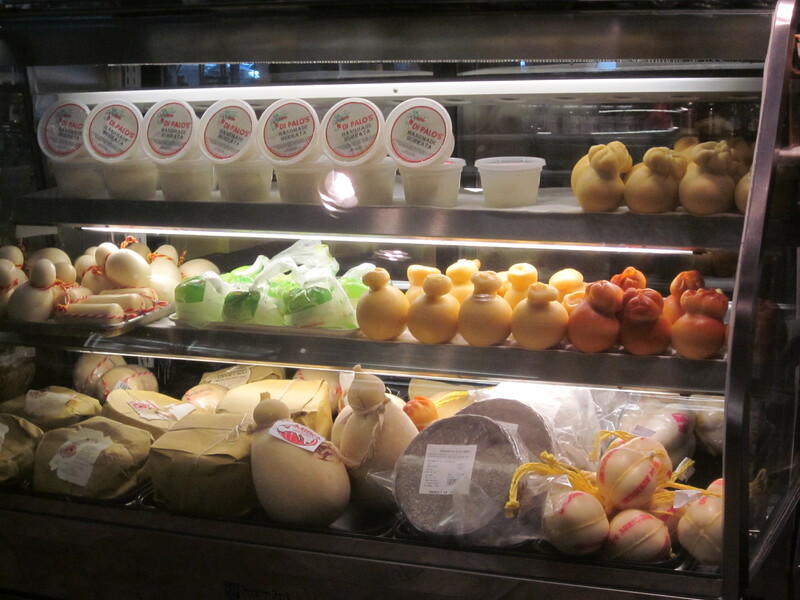 “All I know is that my Italian grandmother calls it sauce…” I insisted. “You sure she’s Italian,” someone cracked. At that, a bong might be tipped over. And beer was definitely spilled. “Come to Worcester and my Nonna will make you a nice gravy,” someone from Mass joked. “Should I bring the mashed potatoes?” I would shoot back. The arguments were endless and had no resolution. And just like that, we were onto another of our favorite topics. Since those days, I’ve still maintained my allegiance to calling sauce what it is…sauce. But over the years I’ve mellowed. 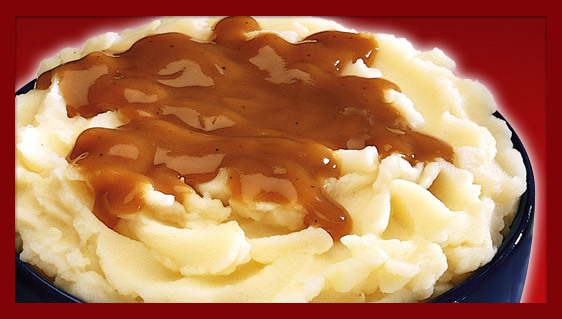 I am no longer appalled when I hear someone mistakenly label what my grandmother referred to as sauce as gravy. I get it. It’s what the ill bred were taught. It wasn’t their fault. They were just poorly misinformed about worldly culinary matters. As I said earlier, my Grandmother made Sunday sauce with an assortment of meats; pork, beef, sausage, etc. But on a very rare Sunday when none of the above were on hand, she would make the sauce with chicken. 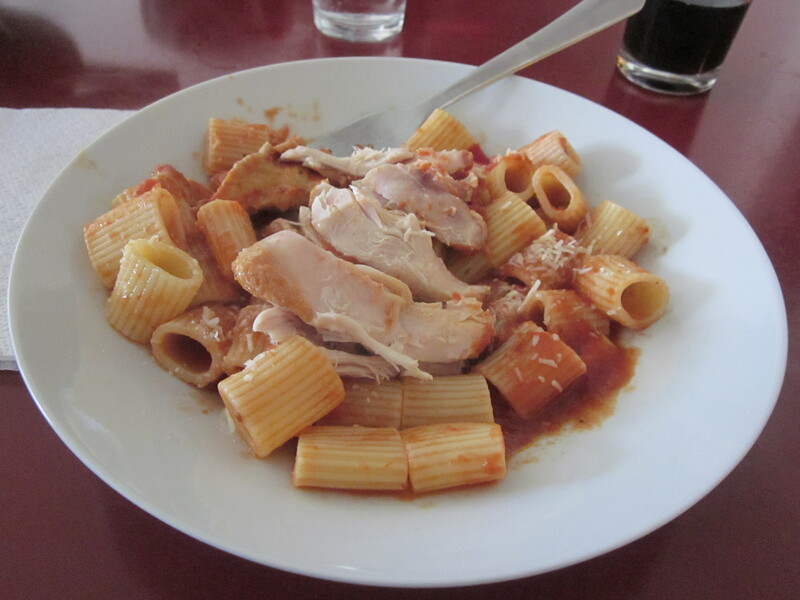 Chicken in a Sunday sauce might seem like an anathema, but if you’ve never tried it don’t knock it. The flavor from the chicken, different from the usual meats, gives the sauce heartiness equal to what you might get from red meats but with a slightly smoother taste. 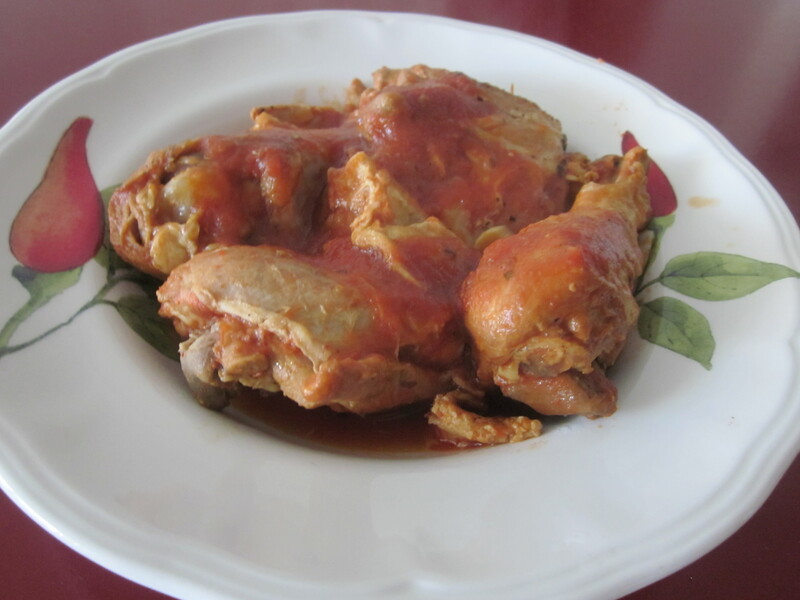 It works and not only as an enhancement to the sauce, but also as a way to enjoy the chicken which, after slowly cooked, remains amazingly moist, the sauce practically absorbed into the meat itself. As part of my willingness to be more accepting to those not as cultured as I, I’ve decided to make a concession by naming what most definitely is a sauce, as gravy. I hereby extend my magnanimity to those I spent countless wasted hours trading insults with and present here, as I sit on my hands so I don’t hold my nose, my recipe for—Pasta with Chicken Gravy. You can make this sauce on the stove top, in fact, it’s probably the best way. If you don’t have the time to stick around the kitchen for hours, a slow cooker works and that’s how I made mine for this recipe. The result, I learned, was equal to what you would accomplish on top of the stove. In a large frying pan, heat one tablespoon of the olive oil. Season the chicken parts with salt and pepper. Drop into the hot pan and brown on each side. About two minutes per side. 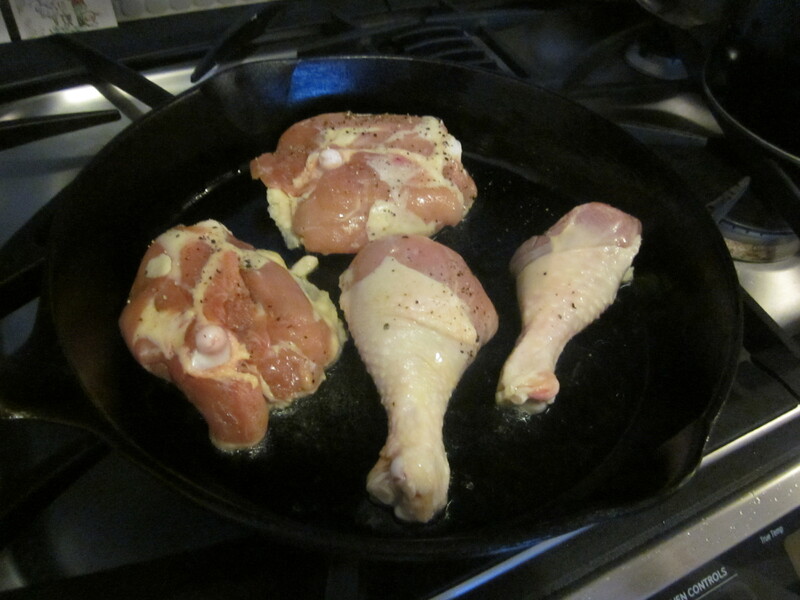 Once the chicken is browned, put it to the side. Throw the garlic into the same frying pan you used for the chicken and cook on medium heat until just lightly brown; two to three minutes. If the pan is dry, add the other tablespoon of oil. Scrape the oil and garlic into the tomatoes in the slow cooker. Return the frying pan to the stove, turn on to medium-high heat, add about a quarter cup of red wine to deglaze the pan. Cook for about five minutes tops or until the wine cooks down. 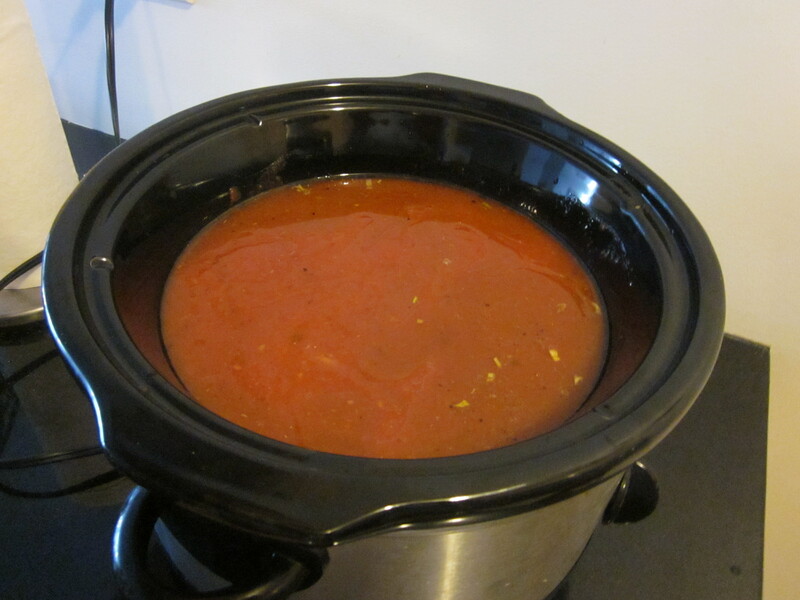 Pour whatever liquid and bits from the chicken and garlic remain into the tomatoes in the slow cooker. Add the browned chicken to the slow cooker. The “gravy” is now ready to be cooked very slow. Turn on high for one hour and then set to low for about six hours. 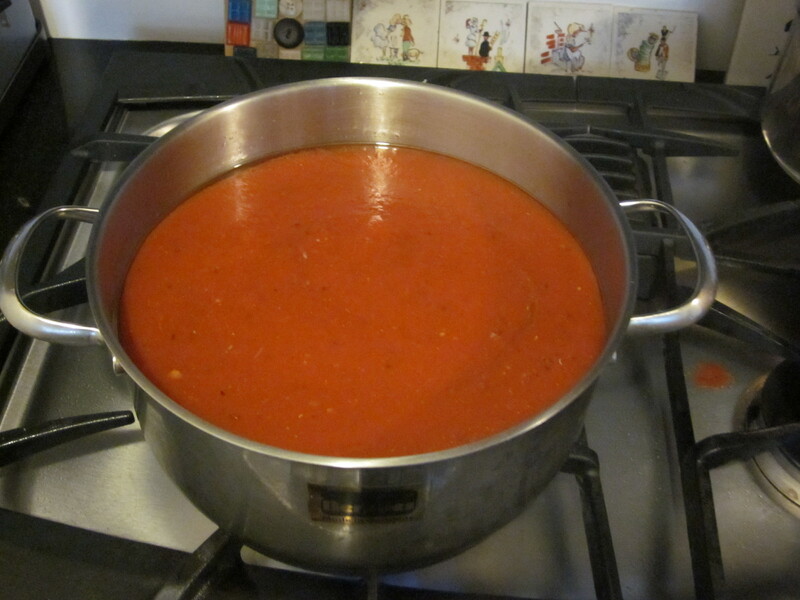 After six hours, if the sauce is too thin for your taste, remove the top, turn to high and cook for another hour or so with the top off until the sauce forms your preferred consistency. Remove the chicken pieces to a separate platter. Serve the sauce…I mean gravy…over your favorite pasta. 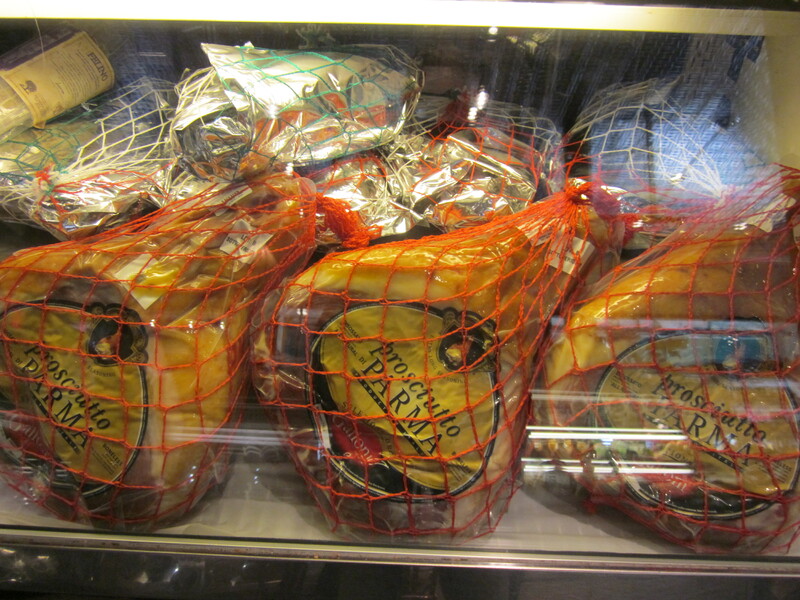 Top with grated Parmigiano Reggiano or Pecorino Romano. Enjoy, take a look at what’s in the bowl and keep repeating to yourself: “I am eating gravy. I am eating gravy. I am eating gravy.” Say it enough and you might even believe it. 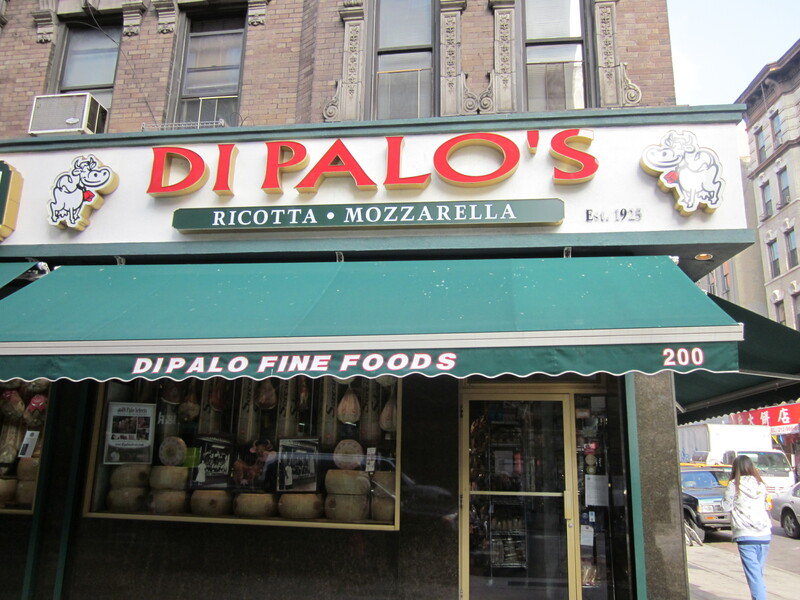 Located on Mott and Grand Street for 87 years. Instead of a bunch of price gouged roses or a mediocre prix fixe Valentine’s dinner, I want express my faith in your New York food knowledge along with my appreciation for all your support to Fried Neck Bones…and Some Home Fries.with this post-Valentine gift of the February edition of Name That Place. The photo above is an easy starter. 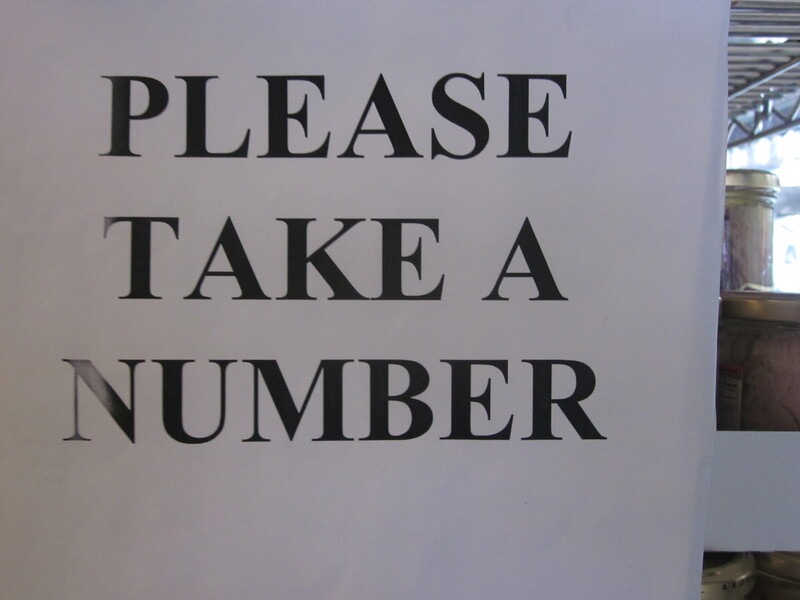 You’ll need to “take a number,” to have any shot at some of that good looking prosciutto Parma behind the counter. 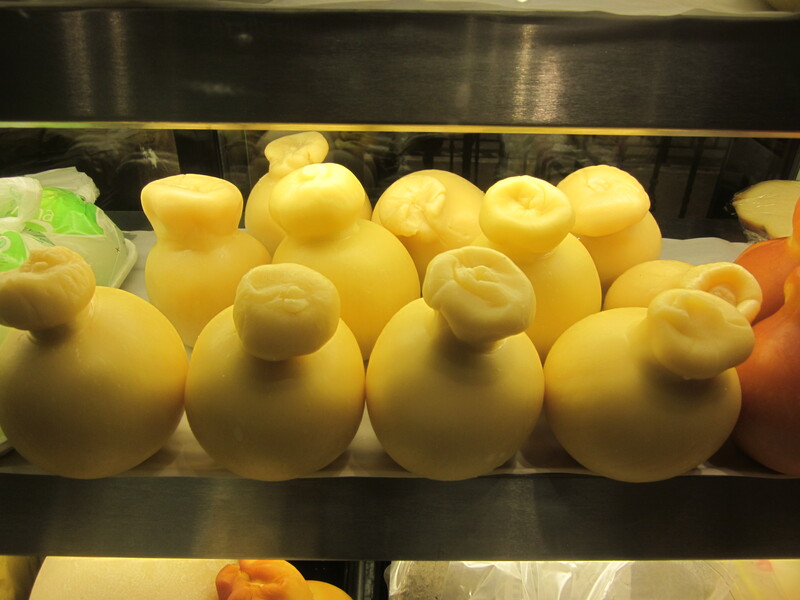 Bonus points if you can also name that cheese. Enjoy this February 15th Valentine and leave your answers in the comment section below. The name of the place will be revealed here on Monday. I’ve seen the film numerous times, but only on video and that scene has always made my mouth water. Now if I ever had the pleasure of viewing Always for Pleasure at a screening where the filmmaker was in attendance and employed his gimmicky, yet sadistically ingenious technique of “Smellaround;” the addition of the actual aroma from a big pot of red beans and rice being cooked within the theater itself, the gurgling from my stomach would probably drown out the dialogue from the screen. Instead, the film motivated me to make red beans and rice according to Irma Thomas’s recipe. I was able to find a copy of the recipe in a 1986 book called Totally Hot! The Ultimate Hot Pepper Cookbook, by Michael Goodwin, Charles Perry, and Naomi Wise (Dolphin Doubleday). The recipe, adapted by Les Blank from Irma Thomas’ recipe is much more complicated than what she recited in the film. Hers was brief and simple. I made Les Blank’s recipe from the book. The result, however, for whatever reason, was a slight disappointment. Since then I’ve tweaked the recipe borrowing much from it, including an enormous amount of garlic. Irma Thomas suggested using a half head. Blank, who made another masterpiece in 1980, Garlic is as Good as Ten Mothers, centered around the Gilroy Garlic Festival in California, so we know where he stands on the benefits of the “stinking rose,” calls for a full head. For what I made, I used probably three quarters of a head of garlic, In Blank’s recipe, a smoked ham hock is called for and that is what I used when I made his recipe. Thomas, in the movie suggests using “seasoning meat of your choice.” My choice for this batch of red beans was Andouille sausage. Also instead of using a big pot on the stove, I switched to a crock pot hoping the consistent, low temperature would produce better results. 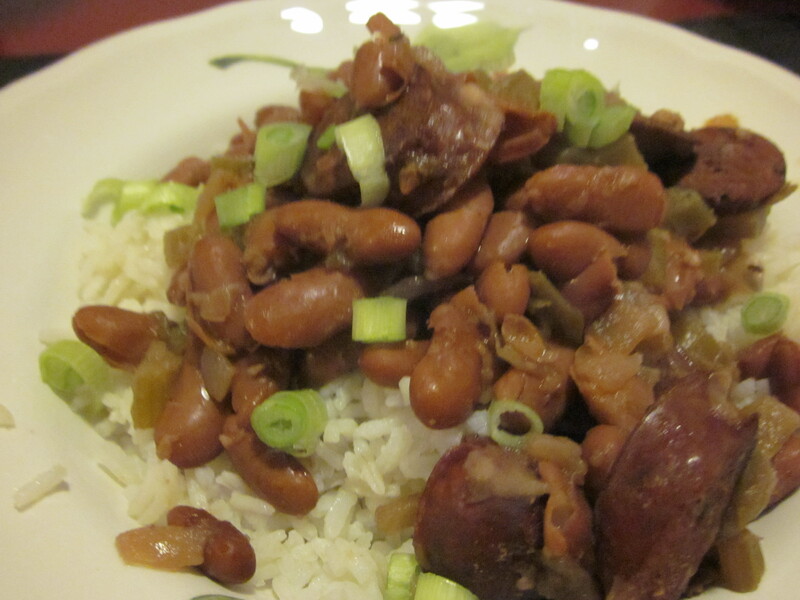 Beyond those changes, I’ve left much of the other red beans and rice basics intact. So here, for your Fat Tuesday pleasure is the Neck Bones rendition of Irma Thomas’s version combined with Les Blank’s Always for Pleasure red beans and rice. 1 lb of Andouille sausage (any other garlicky smoked sausage will work too), sliced. *If you don’t have creole seasoning, you can add ½ tablespoon each of black pepper and cayenne pepper or more cayenne than black, depending on your spice preference. If you are a reader of Fried Neck Bones…and Some Home Fries you know I prefer the easy to the difficult when it comes to my own cooking. Following that philosophy, I rarely use dried beans going the lazy route with canned beans as a substitute. 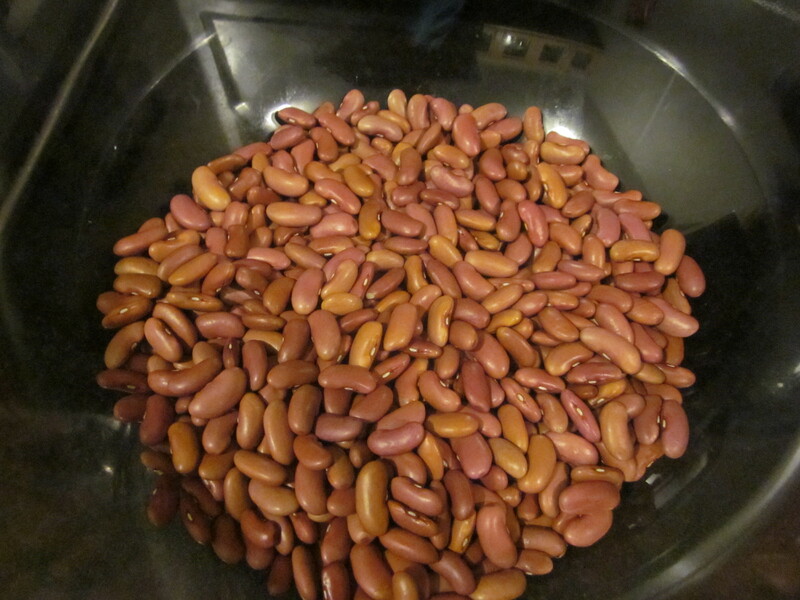 For this recipe, however, I think dried beans are best because of the very long cooking time involved. So soak the beans in water at room temperature overnight and then pour off whatever water remains and rinse them again in cold water. 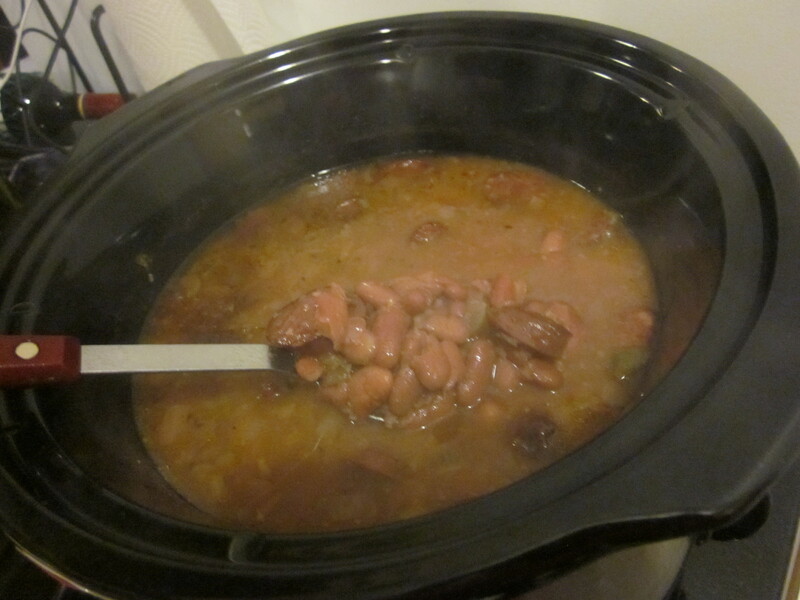 Put the beans in a crock pot or slow cooker and cover with the water. 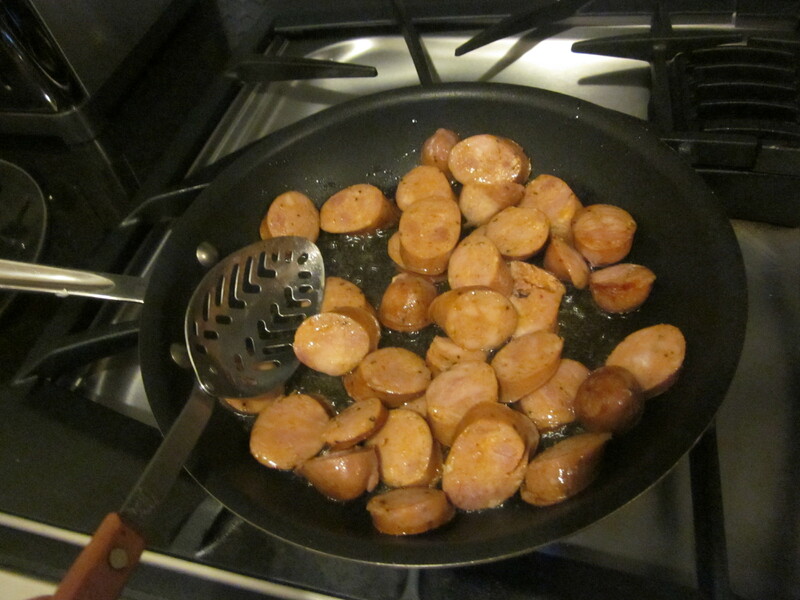 Quickly sauté the sausage to cook off a bit of the fat. You don’t need to do this; you can just throw in the sausage and the excess fat will just add more flavor of the beans, But if you want to limit your fat intake somewhat, either sauté it and drain with a slotted spoon, or boil it briefly first and then add to the crock pot. Cook the onions, celery, and bell pepper for about three minutes in the grease from the sausage and then, again with a slotted spoon, add it all to the crock pot. Toss in the minced garlic and the Creole seasoning. Turn the crock pot on low and cook for about eight hours until the beans are so soft they meld with the cooking liquid giving it all a creamy consistency. Looking for that creamy consistency. Not quite there yet. Serve over cooked white rice and sprinkle with chopped green onions. Enjoy with a cold beer or maybe borrowing from another Fat Tuesday celebration, this one in Brazil, with a cold caipirinha, the recipe for the cocktail can be found here A Lime Cut Three Ways: The First Cut . 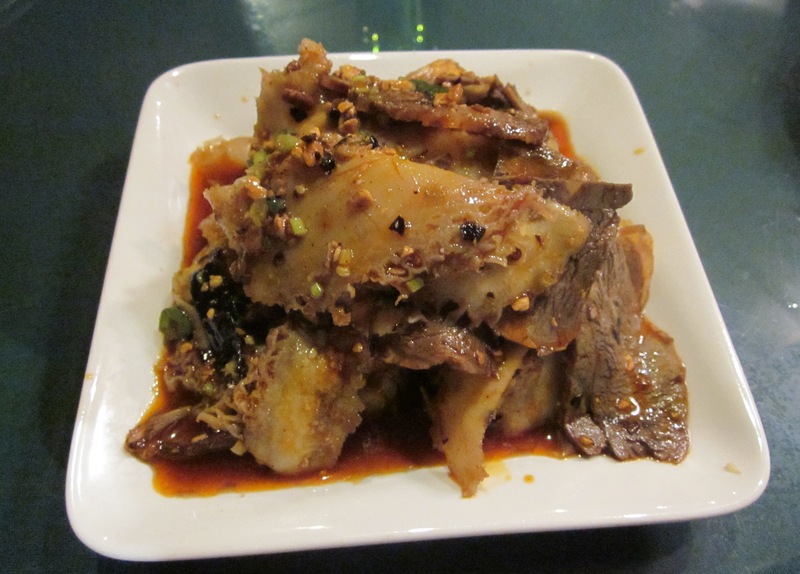 As the Year of the Snake approaches, I realize I have spent much of the past Year of the Dragon in Chinese restaurants. I’m afraid I didn’t always make good choices. And when I did, the result usually tasted good. Can you ask much more than that from the choices you make? 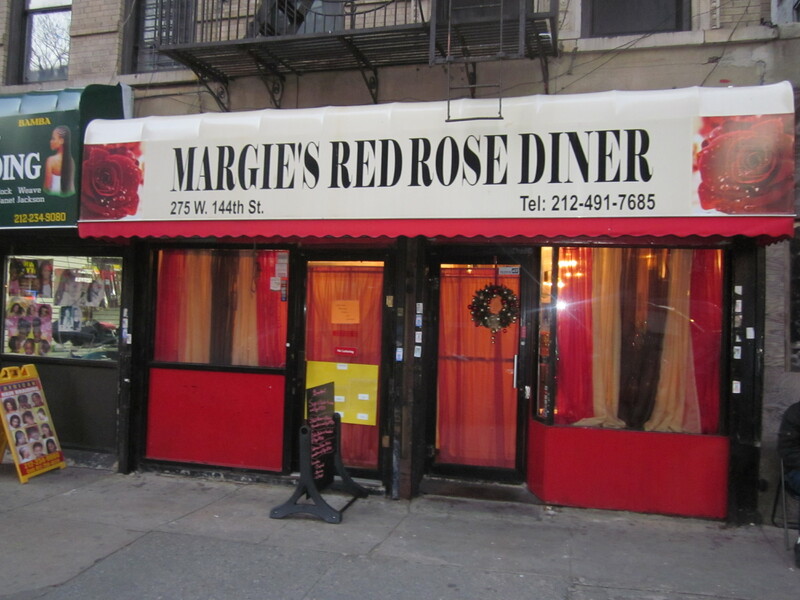 The door opened and, as if someone gave him a swift kick to the buttocks, Zio stumbled into Margie’s Red Rose Diner. Koko, the restaurant’s proprietor, jumped back in shock as Zio’s rotund frame almost fell on top of her. It took a moment for Zio to right himself from his Kramer-like entrance, but longer for Koko’s heart to stop racing from what could have been a very ugly and most likely painful experience if indeed, the heavy load that is Zio did knock her over. It was a cold, snowy evening and maybe that was the reason for Zio’s misstep. 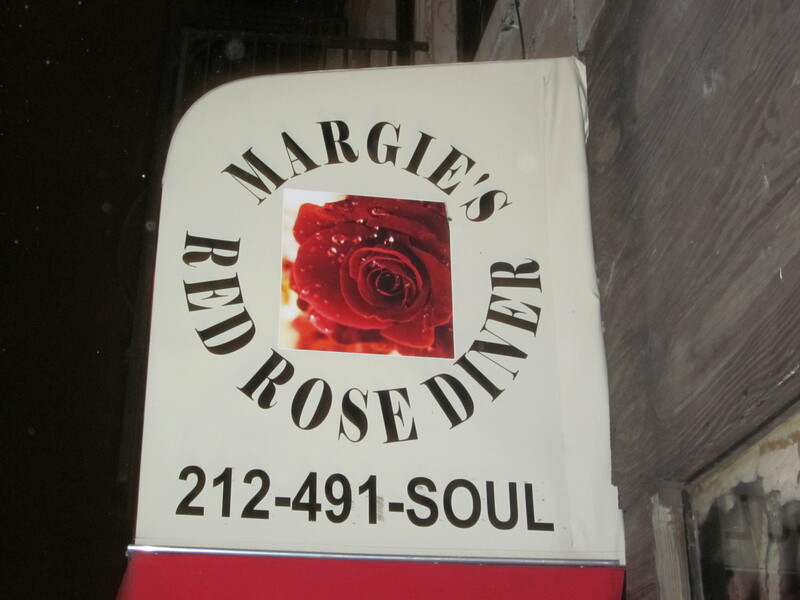 Or it could be just his over-eagerness to finally eat at Margie’s Red Rose Diner. 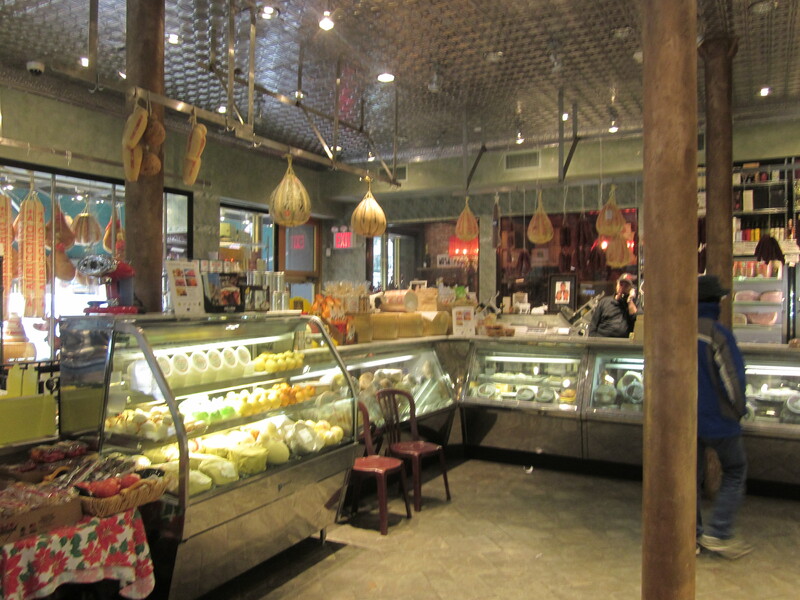 Either way, no damage had been done and Gerry, Zio and I had our pick of any table or seat at the counter we wanted. The restaurant was empty. Once Koko’s heart settled, she gracefully assumed her role as both hostess and chef of the family-run Margie’s. 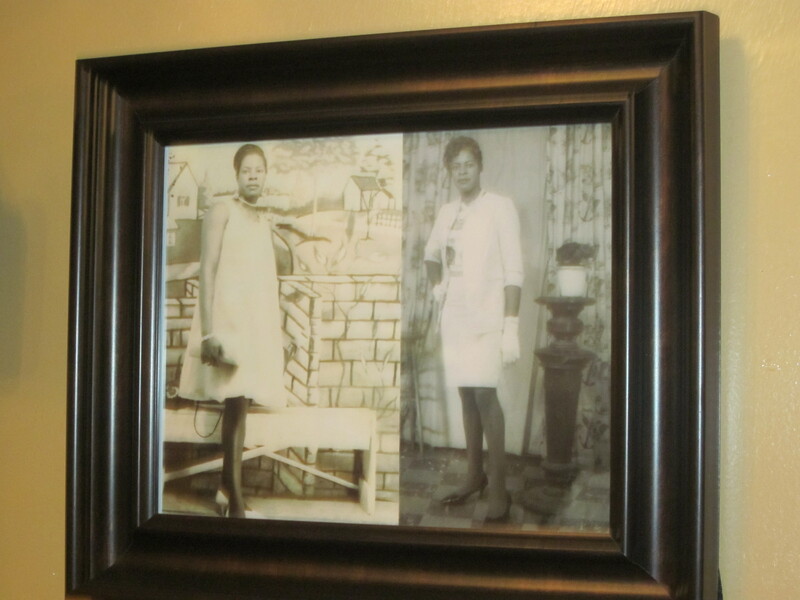 The restaurant’s namesake, Margie, was Koko’s mother who ran the restaurant for over thirty years before her passing in 2009. After closing to reassess and remodel, Koko and her husband, known as “Poppa,” now run the small Harlem soul food spot continuing in the same, down home tradition Margie fostered. Margie back in the day. We looked at the menu which featured “breakfast all day,” but it was dinner time and though sage sausage, fish and grits, banana pancakes, and salmon croquettes were very tempting, we stuck to the “PM” side of the menu. When asked what he was going to order, Gerry, who was intently perusing the dinner options, mentioned either the turkey wings or the smothered pork chops. We weren’t on a Chow City assignment. There were no rules. That made it easy. Gerry went with the turkey wings, Zio the smothered pork chops and now it was up to me to decide between the porgies or whiting. That made it easy. I ordered the fried whiting with collard greens and baked macaroni along with a delicacy for me: toasted, buttered white bread. Even if we had a choice in the matter, we were more than all right with that. Red roses were everywhere at Margie’s. While we waited for the smothered pork chops, to arrive, the television above our table was on to the evening news. The lead story was a report on an epidemic attack of the norovirus, also known as the stomach flu that was sweeping across the United States. While we listened to hysterical warnings of projectile vomiting and extreme diarrhea, as if on cue, the pork chops, fried and then literally smothered in a dark brown gravy arrived. Despite the unappetizing news, we vigorously devoured the tender chops. Smothered pork chops, candied yams, collard greens. Next to arrive were the turkey wings, the meat falling off the bone, and smothe in the same gravy used for the pork chops. On a cold, snowy night, no one was complaining about too much gravy. The fried whiting completed our family-style trio and received high praise from all for how delicately they were fried. “This is definitely not tilapia,” Zio confirmed rapturously. 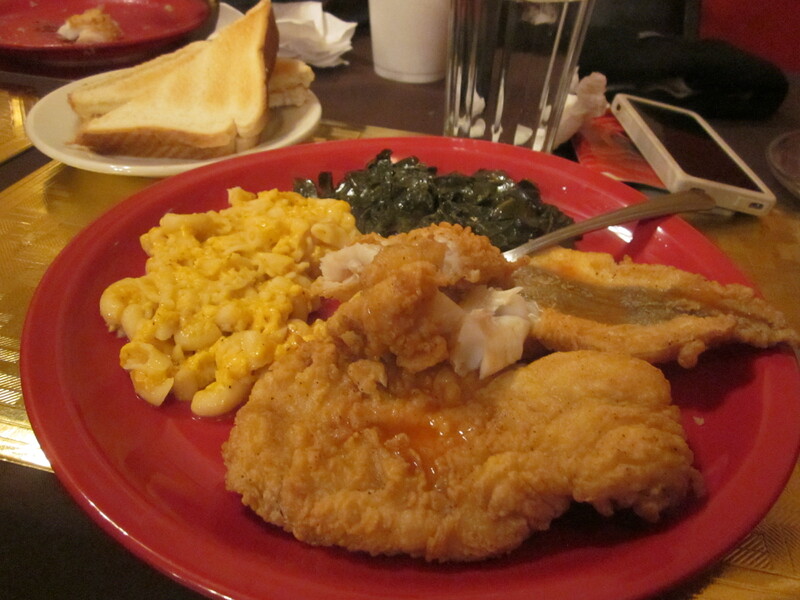 Fried whiting, baked macaroni, collard greens and buttered white toast. “Where you from,” Koko asked as she came over to check on us. 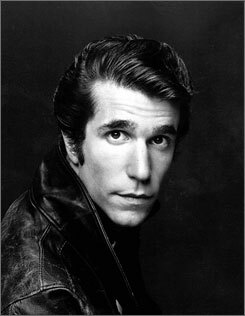 “125th Street,” I told her. “Are you in radio? You have a radio voice,” she asked me. “And your voice is like his too,” Koko said. “The coach? 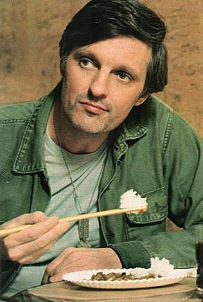 I always thought I was the quarterback,” I said, disappointment obvious in my now mumbling voice. I knew what Craig T. Nelson looked like. He was balding—with a prominent nose. I didn’t see the resemblance, but if Koko thought I looked like Craig T. Nelson, I wasn’t going to argue. “How many pounds ago,” Gerry cracked. The expert use of the chopsticks are a giveaway that the man above could not possibly be Zio. We were hoping for dessert, but Margie said she had run out of her homemade lemonade pie. “Lemonade pie? Wasn’t that in a song?” Gerry asked. “Judy in the Skies,” Zio said. Gerry quickly googled the song on his phone. A You Tube video from the 60’s came up. We watched it and heard the lyrics mentioning lemonade pie. 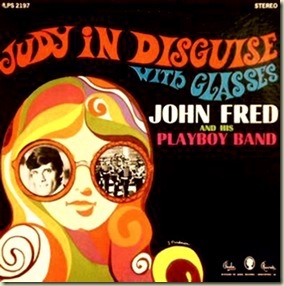 “I always thought it was Judy in the Skies,” Zio said. We paid the check and took the allotted ten minutes to get coats, gloves, and hats on. “We’ll be back for lemonade pie,” I said, speaking for all of us. “You better,” Koko said and then made sure she steered very clear of Zio as he attempted to exit. I heard something on the radio the other day during the hysteria surrounding the frigid snap that recently gripped the northeast. A man was telling the story of how he was working in single digit weather and bought a hot cup of coffee. He had to place the coffee down and go off to handle a chore. He was gone just a few minutes, but when he had returned to his coffee, it had turned to ice. Now I know it’s been cold out there, but, really, a hot cup of coffee instantly turning to ice? It made me think of the polar opposite; when the temperatures hit three (Fahrenheit) digits and the tall tales about frying eggs on the sidewalk begin to circulate. The last time that happened, in the summer of 2011, I thought I would test the theory. I dropped an egg on the sweltering rooftop where I live to see how quickly it would fry. The result of that experiment was documented here on Fried Neckbones…and Some Home Fries with the post: Rooftop Fried Eggs. Since I tried the fried egg theory here, I thought I could do the same with coffee. 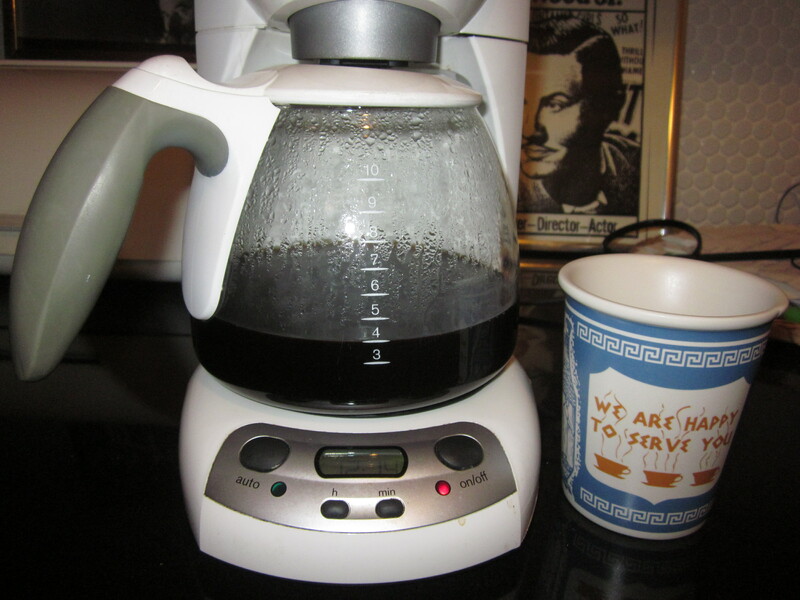 I started, of course, with a hot cup of coffee. Granted, New York was not in the single digits. 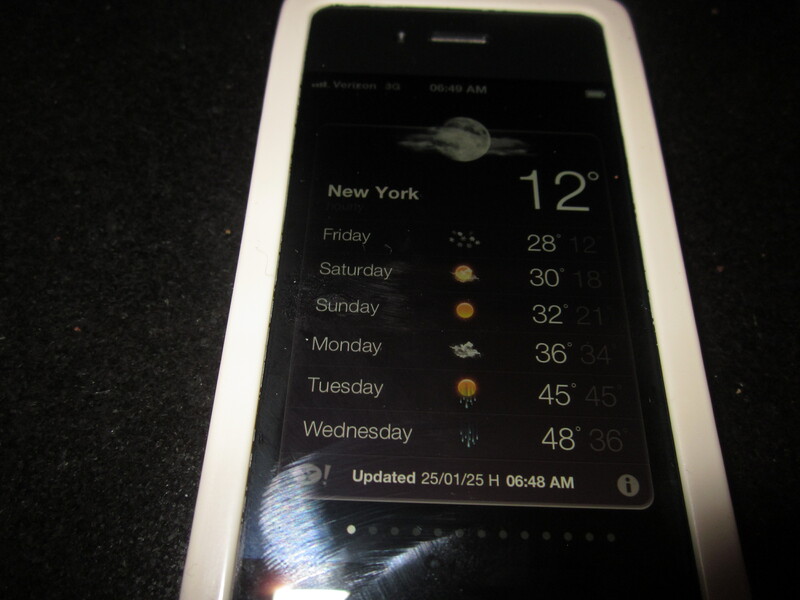 I would take the balmy 12 degrees into account. 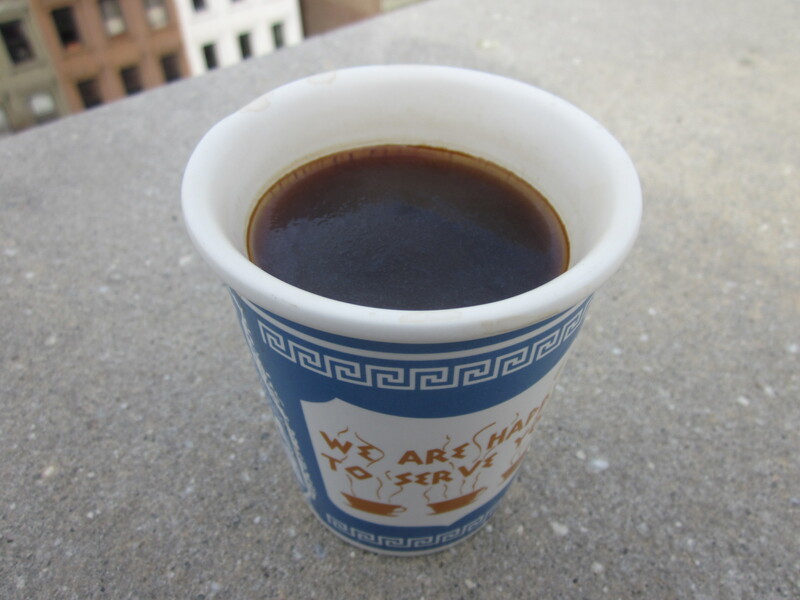 I brought the hot coffee up to the roof and then got out of the cold. After a half hour I checked on it. The coffee wasn’t frozen. In fact, it was actually lukewarm. I returned in an hour. The coffee was very cold now, but still no ice. After one more hour, I returned to the roof. And what did I find? And really, what’s more refreshing than a cup of black iced coffee on a 12 degree day? So what did we learn from this little exercise? 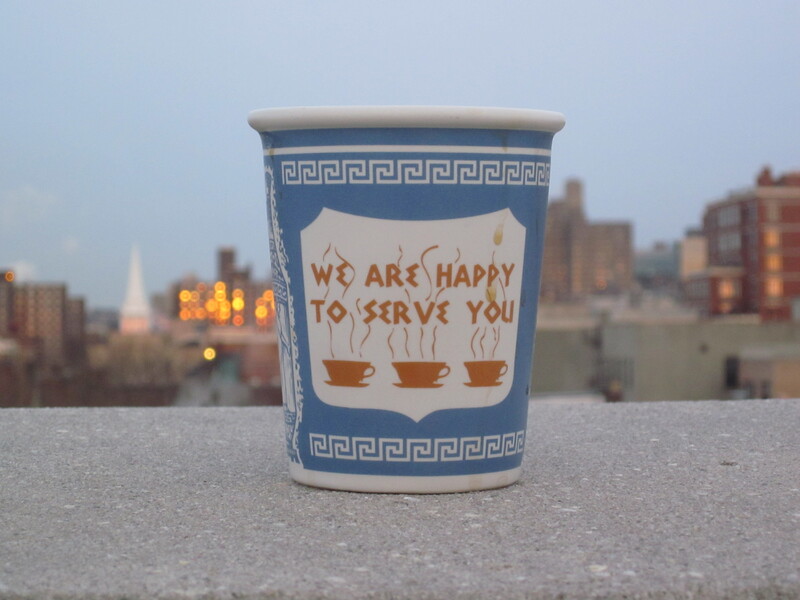 That hot coffee freezes in twelve degree weather in roughly two to three hours? Or more importantly, that the author of this experiment has much too much time on his hands?